Sauce. It’s what transforms a monotonous lunch into a culinary excursion. From “ho hum” to “holy tastebuds, Batman” – the perfect sauce is a boost of awesomeness. 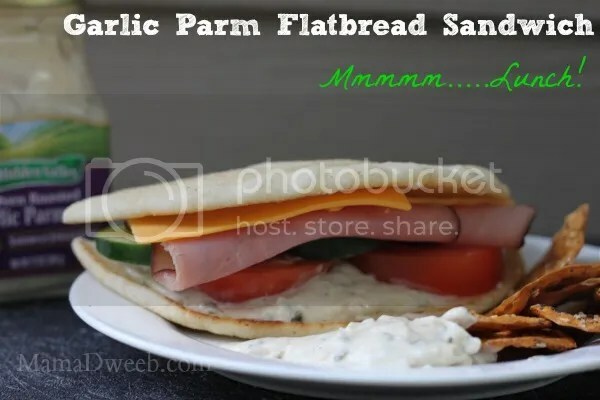 I took my favorite sandwich toppings – honey cured ham, fresh garden tomato, cucumber, sharp cheddar cheese – and topped it with a creamy Garlic Parmesan Spread from Hidden Valley Ranch. I took each bite really slow, savoring the spice of the garlic and creaminess of the parmesan cheese. And even better? This spread is nice to my body. It is made with cream cheese and white beans! Hidden Valley™ Sandwich Spreads & Dips are low fat with one-third the calories of mayonnaise and only two grams of fat per serving. Two grams of fat. Optional – but you have to try it – Put the sandwich open-faced on a cookie sheet and broil in your oven. Toast it just long enough for the bread to turn golden brown and the cheese to get all gooey and melty. Enjoy with your favorite chips/pretzels and use the sandwich spread as a dip! There are four total delectable flavors in the line of spreads: Smoked Bacon Ranch, Country Herb Ranch, Oven Roasted Garlic Parmesan and Spicy Chipotle Pepper. Imagine the possibilities! I am thinking toasted chicken, roast beef, top your black bean burger with it! Sandwiches for lunch just got more fun. « Only 1 week left! #Free Beano Ya’ll!